An old adage states that you only meet two great people in a lifetime. After visiting Col. John W. Ripley (USMC Ret. ), I can say I met my first one. 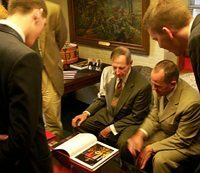 As Col. Ripley politely invited my colleagues from Tradition, Family and Property Student Action and me into his office on October 31, I felt tremendously honored to meet one of America’s greatest living war heroes — a man who served in active duty for thirty five years in the U.S. Marine Corps. After this operation, Col. Ripley’s mission was far from over. Unlike Hollywood movies, in which a bridge blows up and everyone lives happily ever after, the North Vietnamese found an alternate route. During the next days of fighting, Life Magazine published a famous picture of Col. Ripley running as a mortar round blows up nearby. He showed us this amazing photograph during our meeting and many other war relics. He picked up the body of his radio man and walked away very slowly, expecting a bullet to hit him at any moment. Suddenly, some South Vietnamese bodyguards or “cowboys,” as he called them, popped up over a ledge about 100 meters away and addressed him by his Vietnamese nickname, which meant “Captain Crazy.” They told him to duck while they sprayed cover fire allowing him to make a desperate 100-meter dash for safety. Smiling, Col. Ripley recalled how he ran those 100 meters in 3 seconds! 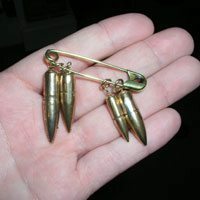 Colonel Ripley carries with him the four bullets he was wounded by in Vietnam. The most interesting part of our meeting was when Col. Ripley explained the essence of a true leader is one who sets the example and shows his troops how to act, rather than tell them what to do from a desk and ask them to report back. Col. Ripley is one such leader. He never shied away from action, but always preferred to be on the front lines with his men. In addition to being deadly on the battlefield, this tough marine is also lethal in the realm of ideas. After hearing about the TFP Student Action debates on university campuses, he described the wonderful time he had appearing on Crossfire to debate a female Air Force general defending the need for women in the military. She could not stand up against the bulletproof logic of Col. Ripley’s real life combat experience. Col. Ripley deserves our tribute, respect and admiration. This entry was posted in Fighting the Culture War and tagged admiration, America, bridge, Catholic, Chivalry, Church, Col, colonel, Cross, Dong Ha, faith, hero, Jesus, leader, life, Marine, Mary, military, model, Navy, Ranger, respect, Ripley, story, Story of Exceptional Valor and Faith, TFP, tribute, valor, Vietnam by Cesar Franco. Bookmark the permalink.